To some, the idea of a winter wedding is romantic, gorgeous and unique. To others, it is insane. No matter where your opinion lies, we have come up with a few winter wedding ideas to help you picture yourself walking down the aisle in a winter wonderland. According to the Society of American Florists, only 13 percent of weddings take place in the winter (as opposed to 35 percent in summer, 29 in spring and 23 in autumn). It might not be the most popular time of year for a wedding but that is exactly why it makes sense. There are many practical benefits to scheduling your big day in the colder months, such as considerably less competition for top venues and vendors as well as off-season wedding prices. Dollars and cents aside, a winter wedding can be an elegant and unforgettable affair and there are many unique opportunities available to those planning a winter wedding. For one, if you are picturing a ‘white wedding’ what better time to get married than winter? There is something magical and romantic about being cozy indoors while overlooking a snowy landscape. There are an endless number of ways to incorporate the winter theme into the details of your wedding. For starters, just think about the possibilities available with winter wedding invitations, winter centerpieces and winter wedding cakes. 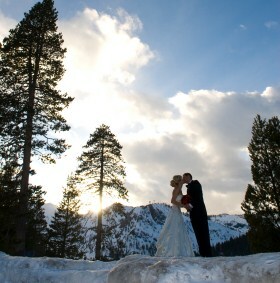 Many couples chose to have a winter wedding because they are just crazy for Christmas. I think we all know someone like this. The holiday season is a magical time of year and that feeling can make a wedding that much more special. Take advantage of that holiday cheer! The New Year’s Eve wedding is also quite popular and can be truly glamorous, though some of your guests who have other plans may feel differently. Scheduling conflicts aside – planning your big day on New Year’s Eve, the most festive holiday of all, can make for a truly unforgettable day. Many of us spend our summers attending an endless number of weddings, so much so that we dont even realize how special a winter wedding can be. No matter what you are planning - we wish you the best of luck! Do you have any more winter wedding ideas? Let us know in the comment section below.